Hockey Plumber: Vancouver tells Roberto: We Luongo you long time! 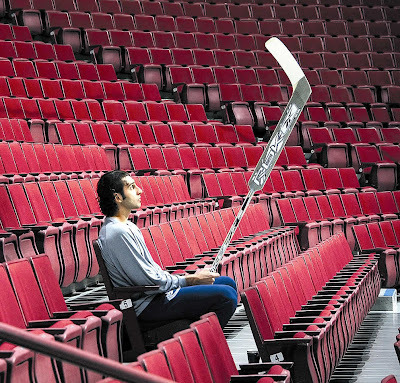 VANCOUVER SUN — "Roberto Luongo has agreed to a 12-year contract extension through the 2021-22 National Hockey League season worth $64 million US, the Vancouver Canucks announced today. The deal breaks down like this: in 2010-11, the first season of the extension, Luongo will earn $10 million. In 2011-12, he will make $6.716 million. From the 2012-13 to the 2017-18 seasons, he will earn $6.714 million each campaign. In 2018-19, Luongo will make $3.382 million, which will drop to $1.618 million in 2019-20. In the final two seasons of the contract — the 2020-21 and 2021-22 campaigns — he will earn $1 million each. For the Canucks, the annual salary cap hit will be $5.33 million..."
I give the Canucks credit for getting him to sign a win-win deal that is manageable from a cap perspective. However, did they still pay too much? Marc-Andre Fleury's deal at $5 million per raised some eyebrows, yet in a short time, he has accomplished much more than Luongo has in the post season, reaching the Final twice and winning a Cup last season. Luongo was again stellar in the regular season, but only so-so in the playoffs. "...Luongo said last year's second-round playoff loss to Chicago — and the 7-5 Game 6 defeat — will motivate him in the future. 'You always have something to prove in this game and there's always somebody pushing you from behind,' he said. 'Unfortunately, one game has ruined a lot of things for me but you try to move on and turn the page because that's not who I am. Unfortunately, things happen but moving forward, we're all in it to win a Stanley Cup and I'm really looking forward to the opportunity over the next few years to try to bring one to Vancouver.' "
Luongo has been traded twice in his career and both times for, what seems in retrospect, next to nothing. His new contract will pay him handsomely. He says and does all the right things on and off the ice. Will Vancouver build a team around him good enough to win the Cup?